The man once known as H. Rap Brown, whose antics in the 1960s earned him a reputation as the violent left's least-thoughtful firebrand, is now in the dock for murdering a policeman, with a trial scheduled to begin in January. It promises to be one the year's most spectacular court cases. The defendant is one of the leading figures of the American Muslim community, a group newly in the national spotlight. His trial and the events leading up to it offer some insights into that community. The origins of the case go back to May 1999, when a 55-year-old African-American man named Jamil Abdullah Al-Amin was stopped on the outskirts of Atlanta, driving a stolen Ford Explorer. To avoid arrest, he flashed a police badge from White Hall, a small town in Alabama. The ruse worked, and he was let off-but not for long. An investigation found that Al-Amin was no officer; in September 1999 he was indicted, on charges of theft, impersonating an officer and driving without proof of insurance. He was assigned a court date in January 2000. 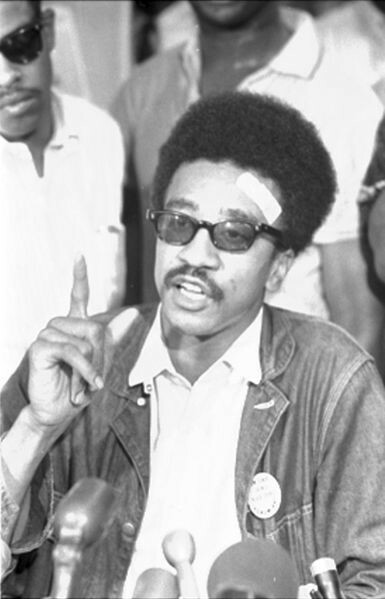 Jamil Al-Amin in his younger days, when known as H. Rap Brown. When Al-Amin failed to appear at the hearing, a warrant for his arrest was issued. At about 10 p.m. on March 16, 2000, two Fulton County sheriff's deputies, both African-American, rode over to Al-Amin's small grocery store in West End, one of Atlanta's poorer sections, to serve the warrant. The young officers were cautioned about the fugitive: "aggravated assault, possibly armed." But they had no idea they were pursuing a famous black nationalist and the self-styled namesake of "rap" music, whose violent history stretched back to before they were born. Here are some career highlights. H. Rap Brown was a founder and later chairman of the Student Non-Violent Coordinating Committee, whose definition of non-violence included his famous boast: "We're gonna burn America down." In 1967 Brown incited a mob to torch two city blocks in Cambridge, Maryland; "It's time for Cambridge to explode, baby," was his punch line. In 1970, while serving as the fugitive "Minister of Justice" of the murderous Black Panther Party, he made the FBI's "Most Wanted" list for the first time. A shootout during the attempted robbery of a bar on New York City's Upper West Side left him and two police officers injured. He did five years in New York prisons, including a jailhouse conversion to Islam, in which he took the name Jamil Abdullah Al-Amin. Preaching a firebrand version of Islam, Al-Amin in the 1980s became a pillar of Atlanta's burgeoning Muslim community. He and the law stayed on separate paths until 1995, when he was arrested for shooting a drug dealer four times in the legs, and also charged with carrying a concealed and unlicensed .45 caliber handgun. A year later, he was investigated in connection with more than a dozen homicides, which a police report ascribed to revenge, business rivalries and eliminating people who "knew too much." By 1999 he was arrested on charges of driving a stolen car and carrying a concealed weapon. Even so, when the two sheriff's deputies, Aldranon English, 28, and Ricky Kinchen, 35, found Al-Amin standing in a black trench coat by a parked black Mercedes-Benz, they were not prepared for what came next. Finding Al-Amin's hands concealed, they followed standard procedure and ordered him to show his hands. "OK, here they are," he replied and allegedly pulled out two guns, firing first a .223 caliber assault rifle, then switching to a 9 mm revolver. English was shot in both legs, the left arm and right chest. Six bullets killed Kinchen. The next day English identified Al-Amin from a selection of mug shots. Al-Amin, meanwhile, fled to White Hall, Alabama, and for the second time in his life made the FBI's most-wanted list. Four days later he was caught - this time by no less than one hundred well-armed police officers. Al-Amin was wearing body armor when apprehended. Police found in White Hall his black Mercedes - complete with a tell-tale bullet hole-two cartridge clips, a .223 caliber rifle and a 9 mm handgun. Ballistic tests showed the guns to be those used to shoot English and Kinchen. In May 2000, the Fulton County district attorney announced that the state would seek the death penalty, for the murder of Kinchen and other charges. Al-Amin declared himself not guilty. A celebrated former Black Panther on trial for killing a policeman guarantees a media circus. It will also prompt debate about gun violence; the National Rifle Association has blamed Kinchen's death on the casual way Al-Amin was released after his 1995 shooting arrest, arguing that a convicted violent felon carrying firearms "should have been in a Federal prison for up to ten years." But the trial's real significance lies elsewhere - in Al-Amin's Islamic connections. His 1971 conversion came at the hands of Dar-ul-Islam, a Sunni organization of African-Americans. He went on pilgrimage to Mecca following his release in 1976, then settled in Atlanta, where he soon founded the Community Mosque. By 1980, Al-Amin had become spiritual leader-imam-of over thirty Islamic centers belonging to the Dar-ul-Islam "national community." Estimates of its total membership have run as high as 10,000. The Islam that Al-Amin adopted is - no surprise - the radical variety. The transition was easy from the hate-America sentiments he had espoused as a black nationalist in the 1960s. "When we begin to look critically at the Constitution of the United States," he wrote in a 1994 book Revolution by the Book (The Rap is Live), "we see that in its main essence it is diametrically opposed to what Allah has commanded." He chastises American blacks for being too integrated into their country's life: "The problem with African-Americans is that they are so American," he wrote. Men who belong to Al-Amin's Atlanta mosque wear either Islamic-style skullcaps and long robes or black-nationalist combat boots and fatigues. In 1995, two of its members were convicted of illegally shipping more than 900 firearms to groups in Detroit and Philadelphia, and to an Islamic gang linked to Sheik Omar Abdel Rahman, the blind sheikh of New York. One young convert at Al-Amin's mosque subsequently joined Islamic separatists in Kashmir, where he was killed attacking an Indian army post. Al-Amin has never been shy about invoking Islam in his struggle against white "ameriKKKa." Indeed, he falls into the usual trap of the extremist, mirror-imaging - he assumes that the U.S. government reciprocates his own fear and hate. "Islam is under attack on a global scale by those who wish to control the world" he wrote after his 1995 arrest. "The charges leveled against me are in direct relationship to the success that Islam has experienced in our immediate area. My persecution by the U.S. government is nothing new." Al-Amin went on to call the United States a country "where Islam is under attack." Similarly, his first words in an Alabama courtroom, explaining his arrest in 2000 were: "It's a government conspiracy." His habeas corpus petition elaborated on this claim, stating that law enforcement authorities and organized crime "want him dead," and had joined forces to frame him for Kinchen's murder. "This matter is not just about me." he wrote in a letter that was later published. "It is about Islam and the entire Muslim Ummah. There is a pre-meditated conspiracy to destroy Islamic leadership. When the truth is established, the disbelievers will start to do things." One might think, given his record and his wild-eyed views, that Al-Amin would be shunned by America's Islamic establishment. Just the opposite. He has been celebrated by Council on American-Islamic Relations for - of all things - his "moral character." A coalition of Islamic organizations in 1995 called him one of the "leading figures" of American Islam. Al-Amin has been a sought-after speaker on the Islamist circuit, addressing meetings of CAIR, the Islamic Society of North America and the Islamic Committee for Palestine. He has held starring roles at major Muslim rallies, including the Bosnia Task Force USA rally outside the United Nations in New York in October 1995, where an audience of 18,000 heard him condemn the world body for its "betrayal" of Muslims in Bosnia. Revolution by the Book garnered rave reviews in the Islamic press. "Clear, sharp, focused, alert, lively, snappy; eminently reasonable and accessible to one and all," read one assessment, which called it "a classic of its genre." Jamil Al-Amin engaged in the Islamic prayer. Al-Amin is a founding member and past president of the Islamic Shura Council of North America, an institution that makes decisions about Muslim religious life in the United States (for example, determining when precisely the month of Ramadan begins). Even as he sits in a Georgia jail, the Washington-based American Muslim Council - of which he has been acting president - hails him as "a leader in the American Muslim community." All that institutional muscle is now being deployed to get Al-Amin off the cop-killing charge. The Jamaat al-Muslimeen of Baltimore set a target of a million signatures petitioning for his unconditional release from prison. Twelve leading Islamist organizations joined to raise $1.3 million for his legal expenses. 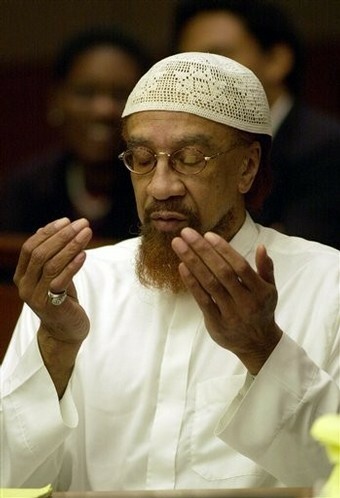 Mosques as far away as Connecticut, New York and California held events to help pay Al-Amin's legal bills. The Southern California Association of Muslim Activists distributed a script to use for telephone fundraising purposes. There was even a "Hip Hop for Consciousness Benefit Concert for Jamil Al-Amin" held in Los Angeles. Those efforts apparently had limited success. Some members of Al-Amin's mosque gave up their campaign when they failed to raise even enough to pay for the printing of fliers. Others fundraised in a more unorthodox manner: Ishmael Abdullah and a partner robbed three banks in 22 days, yelling out as they escaped, "Free Al-Amin!" but their career was cut short with their arrest in May 2000. Perhaps the most telling response is from the Masjid Al-Islam in Los Angeles. Calling Al-Amin "one of the pillars of our local Islamic communities," it portrays his arrest as nothing less than a challenge to "establishing Islam in America." Indeed, the mosque claims that how the trial comes out, "may determine the future growth of Islam in America." It's not likely to do that, but the solidarity with Al-Amin shows the true nature of the leading Muslim organizations - the very ones that are routinely invited to the White House, sought out by the media for their opinions, and invited to engage in interreligious dialogue. They praise Al-Amin's "moral character," rather than condemn his 35-year history of ideological extremism, political violence and personal criminality. They collect money for his legal defense fund, rather than for an educational fund to help pay expenses of the two young daughters left fatherless by Officer Kinchen's death. They sponsor petitions calling for Al-Amin's release, instead of renouncing his actions and calling for justice to be served. This also fits into a larger pattern, whereby Islamist organizations consistently come to the defense of Muslims engaged in criminal activities. When Ahmad Adnan Chaudhry was convicted of attempted murder in San Bernardino, California, last year, CAIR scorned the court decision and set up a defense fund on his behalf. Other groups have come to the aid of Mohammad Salah, who is accused of financing the terrorist activities of the Palestinian terror group Hamas, and of Musa Abu Marzouk, arrested in New York City on charges of murdering on Hamas' behalf. Now is the time for moderate Muslims publicly to denounce the recidivist ex-con accused of killing a police officer in cold blood. Now is also the time for them to denounce the Islamist organizations that are hijacking their religion. This is the chance for moderates to give voice to the Islam that can be a positive force in American life. Jan. 7, 2002 update: On the eve of his trial, I return to this topic, at "[Jamil Al-Amin:] A Muslim O.J." March 9, 2002 update: See "Jamil Al-Amin Goes to Jail" for updates on this case. Related Topics: African-American Muslims, Criminality, Muslims in the United States, Radical Islam | Daniel Pipes receive the latest by email: subscribe to the free mef mailing list This text may be reposted or forwarded so long as it is presented as an integral whole with complete and accurate information provided about its author, date, place of publication, and original URL.